It would not be until the 17th song of the evening that the audience would hear the Carl Perkins tune, “Party,” but in every other way the party for Million Dollar Quartet began the moment the curtain went up last Tuesday on Opening Night at Houston’s Hobby Center for the Performing Arts. With book by Colin Escott & Floyd Mutrux, this latest in the GEXA Energy Broadway Series is above all a concert, but it has a sharp theatrical side as well. 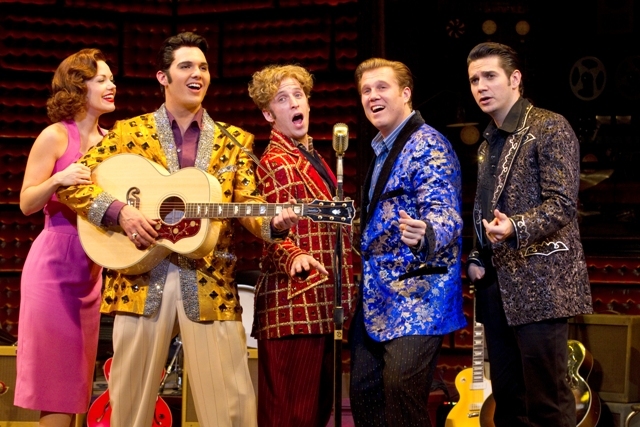 Mutrux developed the original concept and serves as director as this production presents the tale of the one-night gathering of four of rock-n-roll’s legendary figures, Elvis Presley (Cody Slaughter), Carl Perkins (Lee Ferris), Johnny Cash (Derek Keeling), and Jerry Lee Lewis (Martin Kaye). They were brought together by their Memphis mentor, promoter Sam Phillips (Christopher Ryan Grant), the owner of Sun Records. It was there that they all got their start, and there that on this December night in 1956 they would all take yet another step toward the Rock and Roll Hall of Fame. But all the while this story is revealing itself, the audience is being bombarded by the very best of early rock-n-roll from four performers who so closely resemble the look and sound of the real stars that you would swear you were present for the original jam session. Deep-voiced Keeling is the perfect Johnny Cash and seems to vocally supply his own built-in echo chamber. Handsome and hip-swinging Mr. Slaughter has the innocence, good looks and great sound of the early Presley. They are in great vocal company with the solid sounds of Mr. Ferris as Carl Perkins. And for sheer delicious rock-n-roll lunacy and fun we have the dazzling piano work and wild vocals of Mr. Kaye as the hyper-active Jerry Lee. Chuck Zayas on bass and Billy Shaffer on drums round out the sweet musical sounds that will fill the night. For readers lucky enough to get any of the few remaining tickets, here is a sampling of the musical joys that await you. There is a rockin’ opener with a full company rendition of the aforementioned, “Blue Suede Shoes.” Jerry Lee offers a very wild, “Wild Child.” Perkins sends up a powerhouse, “Matchbox,” and follows with the thundering pulsations of, “Who Do You Love?” that fill the room. Keeling brings authoritative command to a truly remarkable take on the Cash classic, “Folsom Prison Blues,” under dreamy violet lighting. Things then take a turn to the feminine side with the arrival of Elvis’ shapely and beautiful girlfriend, Dyanne, played with seductive grace by the velvet-voiced and verysexy, Kelly Lamont. She let loose with the steamy Peggy Lee classic, “Fever,” and the temperatures were definitely rising for the guys in the audience. Wow! Then Elvis dabbles a bit with Dino’s hit, “Memories Are Made of This,” but quickly shifts gears for an electrifying, “That’s All Right.” The four gents get the joint jumping when they team up for, “Brown Eyed Handsome Man,” and a touch of gospel music with, “Down By the Riverside.” Cash follows with bass richness as he sings, “Sixteen Tons,” and Perkins weaves in a bit of counterpoint magic joining with, “My Babe.” Elvis explodes with, “Long Tall Sally,” and then calms things down with a lovely, “Peace in the Valley.” Keeling does full justice to another Cash trademark with a stunning, “I Walk the Line,” and Miss Lamont returns for a soaring and fierce, “I Hear You Knocking.” With the festivities well underway, Perkins finally leads the company in the joyful energy of, “Party,” and really rocks the room. 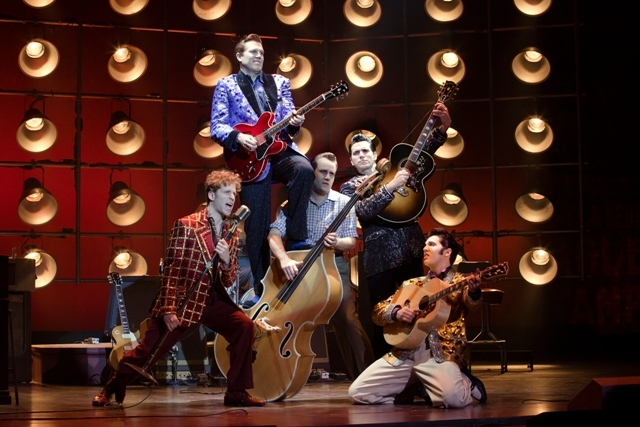 MILLION DOLLAR QUARTET continues at Houston’s Hobby Center through March 4th with 7:30pm performances Thursday & Sunday, 8pm performances Friday & Saturday, and 2pm matinees both Saturday & Sunday. For tickets & information call 800-982-ARTS or visit the website at www.BroadwayAcrossAmerica.com. This entry was posted in Broadway, BroadwayStars.com, Concert Reviews, Miscellaneous Reviews, The Courier Columns, Theater Reviews, ThePeoplesCritic.com and tagged Broadway, Celebrities, concerts, Entertainment, Houston, Million Dollar Quartet, music, musicals, plays, Reviews. Bookmark the permalink.